They may look cute but they can damage your house! Do You Recognize Any of These Bugs? Christopher Pest and Animal Control have been in the animal removal/damage restoration and pest control business over 20 years. The majority of our clients are sent by referrals from happy clients. We can assist you with a wide variety of both indoor and outdoor pest and animal control. We are a premiere pest and animal control agency that has the tools to get the job done. Medical Professionals report thousands of emergency room visits each year due to homeowners unknowingly encountering pests and the dangers they pose. Creatures like raccoons, squirrels, opossums, birds, mice, termites, bees and ants all play an important role in the ecosystem that sustains life on our planet. Unfortunately, they can also pose significant threats to our health, property and way of life. It is when creatures like these cross the threshold from friendly co-existence to threat that they become what we commonly refer to as household pests. When they cross that threshold, you need to call Christopher Pest and Animal Control. A homeowner can often control household pests through a combination of preventative measures including sanitation. However, some pest infestations may be extensive or a particular pest may be difficult to control and over-the-counter-remedies can pose a safety threat to pets and children in your home if not used properly. We serve the Chicagoland area and Illinois providing a comprehensive approach to our customers’ needs by offering pest and animal control services. Please contact us with any questions regarding your pest and animal control management needs at (847) 516-9934. Christopher Pest and Animal Control offers a collection of pest wildlife services for housing and commercial property throughout the greater Chicagoland area. We are insured, licensed and bonded with over 30 years of experience. We offer weekend and evening appointments, same day service and a 30-day money back guarantee. We offer Pest and Animal Control Services for the following: stinging pests, bees, wasps, mosquitos, box elder bugs, earwigs, crickets, moths, ants, roaches, pillbugs, millipedes, stink bugs, spider control, bed bug treatment and termite inspection. Pest control, bug exterminator, bug control, pest exterminator and pest management services is our specialty. We offer monthly, bi-monthly and quarterly treatments. On the Animal Trapping or Animal Exterminator/Animal Control side: raccoons, squirrels, opossums, skunks, birds, bats, dead animals and attic insulation. We are a licensed and bonded animal exterminator and animal trapper. We are here to resolve the problem in a quick and specialized manner. We treat every customer, from the individual proprietor to the large corporation with the highest level of professionalism and attention to detail. 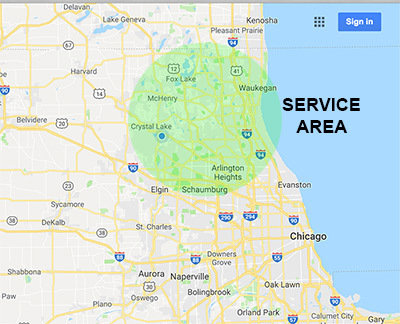 We service the following towns and counties: Cary, Fox River Grove, Trout Valley, Wheeling, Huntley, Lake in The Hills, Palatine, Inverness, Lake Forest, Barrington, Barrington Hills, South Barrington, North Barrington, Lake Barrington Shores, Carpentersville, West Dundee, Hoffman Estates, Schaumburg, Arlington Heights, Northbrook, Highland Park, Buffalo Grove, Vernon Hills, Lake Forest, Mundelein, Libertyville, Grayslake, Round Lake Beach, Deer Park, Lake Zurich, Carol Stream, Elgin, Kildeer, Bartlett, Vernon Hills, Crystal Lake, Arlington Heights, Buffalo Grove, Lincolnshire, Port Barrington, McHenry, Volo and Algonquin in McHenry County, Lake County, Cook County, Kane County and DuPage County. Bees can nest underneath the siding of your house, under shutters or in attic. Bees and wasps are very aggressive and will sting. The gestation period of a female mouse is 19–21 days and they can have a litter of 3–14 young. One female can have 5 to 10 litters per year. Ants can invade your home very quickly especially when there is an ant nest nearby.